Mr. Feng-Yu Li passed examination for “The Special Admissions for Student Eligible for Exemption of Student Fees” and will start his doctoral course (4 years). Mr. Aa Haeruman Azam from Tokyo Institute of Technology joined us as a Postdoctoral Fellowship. Graduate School student (D3) Mr. Tanit Boonsiri won the Start-Up Research Fund for Yong Researchers at Graduate School of Medicine, Jichi Medical University. Assistant Professor Sato Yusuke went Imperial College London for Short-Term Study on Bacteriophage Technology. Professor Longzhu Cui attended "Japan-UK Workshop on Infectious Disease Research", which was held in Tokyo, and had a talk on the ongoing J-PRIDE project. We started our work today with looking forward to being a prosperous and achieving year of 2019. Laboratory's Year-end-party was held at La calmo, Jichiyidai. Lecturer Shinya Watanabe is promoted to Associate Professor. 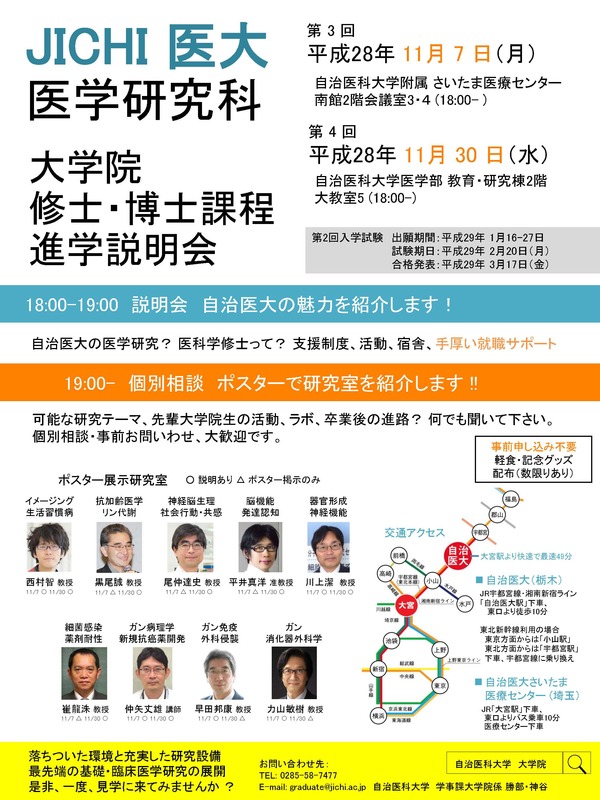 Three faculties and one graduate student attended Japanese Symposium on Staphylococci and Staphylococcal Infections that was hold in Kagoshima Univ. (Kagoshima prefecture). Four faculties and two graduate students attended 18th ISSSI that was hold in Copenhagen, Denmark. Bacteriology lectures and practical training for second-grade medical students are finished. Application for grant of the Japan Agency Medical Research and Development (AMED) "Longevity Science R & D Project: Research on Infectious Disease Control in Elderly Facilities such as Nursing Care Insurance Facilities" got approved (Dr. Sasahara). Application for grant of the Japan Agency for Medical Research and Development (AMED) "The adjustment expenses related to research and development in the first medical field for 2018" got approved (Prof. Cui). Two Lectureers attend The 5th World Congress on Targeting Infectious Diseases – Phage Therapy & Antibiotic Resistance, which was held in Florence, Italy. 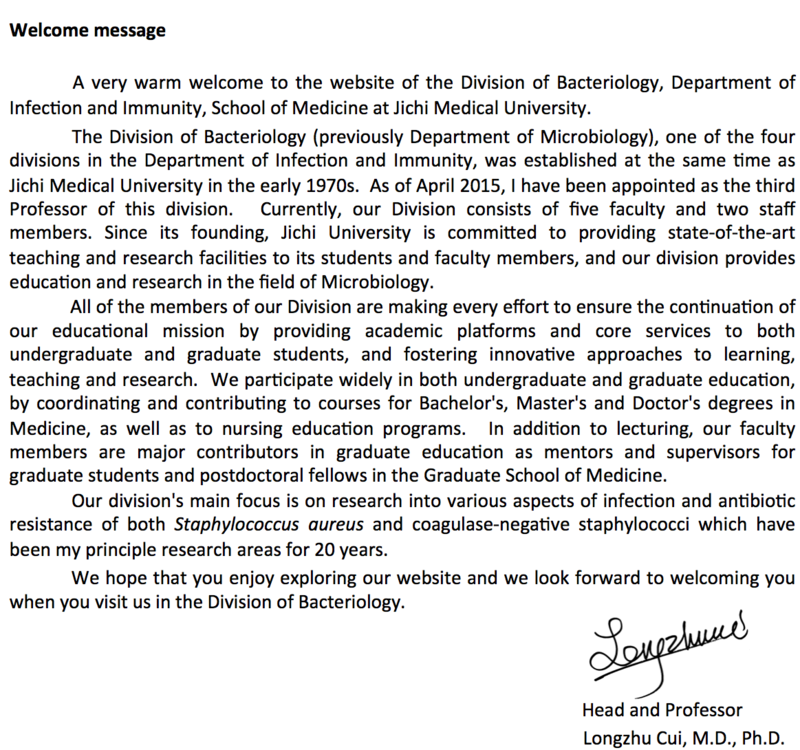 The 3rd Infection and Immunity Department (Divisions of Bacteriology, Virology. Medical Zoology and Parasitology. and Clinical Infectious Diseases) Joint Workshop was held as scheduled at Training Center. Mr. Nichatorn Sungsirin (Dept. of Microbiology, Phramongkutklao College of Medicine) joned us as Research Student. Master course student Mr. FengYu Li's application for "Rotary Yoneyama Memorial Foundation Scholarships" get approved. We started our work today with looking forward to being a prosperous and achieving year of 2018. We obtained two more research grants from non-government foundations: 1) Kotaro Kiga, from Mochida Memorial Foundation for Medical and Pharmaceutial Research; 2) Longzhu Cui, from Takeda Science Foundation. Second-year medical student Ms. Remi Takenouchi joined our group as Volunteer Research Assistant. Univeristy approved the application of Mr. Moriyuki Kawauchi (from The University of Tokyo) for postdoctoral fellowship. Ms. XinEe Tan from National University of Malaysia joined us as Postdoctoral Fellow. Dr. Wanchai Assavalapsakul from Chulanongkorn University (Thailand) joined us as Visiting Researcher. We held a kick-off meeting for strat up the J-PRIDE Project. 6. Yusuke Sato’o, Grant-in-Aid for Young Scientists (B) of JSPS (2017-2019). Second-year medical student Mr. Chen Yoshitatsu joined our group as Volunteer Research Assistant. Dr. Shino Hosoya (University of Tsukuba) joined us as a Guest Researcher. Univeristy approved the application of Miss Tan XinEe (from Malaysia) for postdoctoral fellowship. She will come soon. The 3rd grade medical students Mr. Manabu Suzutani and Mr. Kosuke Sasaki joined our group as Volunteer Research Assistants (after school time program). Second-year medical students Mr. Manabu Suzutani and Mr. Kosuke Sasaki joined our group as a Volunteer Research Assistant (after school time program). Dr. Bintao Cui from Australia joined us as Postdoctoral Fellowship. First-year medical student Miss Chihiro Shimizu joined our group as a Volunteer Research Assistant (after school time program). Dr. Yusuke Taki and Mr. Feng-Yu Li joined us as graduate students. The entrance examination for graduate school was held, and there were two applicants applying to our division. Dr.Tatsuo Taki who was a teather at the time the Jichi Medical Univesity was established jioned us as Contract Lecturer. Application of Dr. Bintao Cui (RMIT Univ., Australia) for JSPS Postdoctoral Fellowship For Research in Japan gets approved. She will join us very soon. We held New Year Pary at laboratory meeting room. We started our work today with looking forward to being a prosperous and achieving year of 2017. Mr. Fen-Yu Li, graduated from Dalian Medical Univeristy, joined us as a research student. Prof. Cui and Assitant Prof. Sato'o attend 17th ISSSI held on 30th August - 2nd September in Seou, Korea. Mr. Kotaro Kiga from Tokyo University joined our Division as a Lecturer. First-year medical student Miss Miwa Ito joined our group as a Volunteer Research Assistant (after school time programs). Confocal microscopy and two-unit CO2 incubator were donated to our laboratory by Professor Kentaro Sugano and Professor Hironori Yamamoto (Internal Medicine Gastroenterology). Thank you to prof. Sugano and Prof. Yamamoto for your kindness. Recruitment for Graduate Students (Master's & Doctoral courses) for 2017 has now opened. Assistant prof. Yusuke Sato'o's proposal for KIEIKAI RESEARCH FOUINDATION RESEARCH GRANT FOR 2016 got approved. Assistant prof. Yoshifumi Aiba's proposal for JICHI MEDIAL UNIVERSITY YOUNG INVESTIGATOR AWARD got approved. Mr. Kanate Thitiananpakorn and Mr. Tanit Boonsiri joined us as Ph.D. students. Temperature Grandient Rocking Incubator TVS126MB was arrived today. Mr.Tanit Boonsiri passed the entrance examination of the graduate school, and will start his Ph.D. course from 1th April. Dr. Avarzed Amgalanbaatar completed his Ph.D. course and graduated this month. Congratulations on graduation! We held a collaboration seminar today with Sequencing Specialist Team of Illunina K.K. on NGS applications in bacteriology. Mr. Tanit Boonsiri from Phramongkutklao College of Medicine (Thailand) joined us as a research student. Two sets of next-generation sequencing systems, MiSeq and NextSeq, are arrived today. We start the new year toward our 2016's mission and vision. Mr. Yoshifumi Aiba from Juntendo University joined our Division as an Assistant professor. Professor Satoshi Omura of Kitasato Institute for Life Science (where Prof. Cui belonged to until last year) has won a Nobel Prize for Medicine. Congratulations! We are so happy for you. Two second-year medical students Mr. Noriki Ikeda and Mr. Ryu Narimatsu joined our group as the Volunteer Research Assistants (after school time programs). Professor Cui, Lecturer Watanabe and Assistant professor Sato'o paid a courtesy visit to The First Professor Mr. Masayasu Nakano (Incumbency: 1973-1996). Professor Cui attend The 14th GRC on Staphylococal Disease held on 11-17 July in Europe at Il Ciocco, Italy. Application for purchase of two next generation sequencer systems, MiSeq and NextSeq, was approved by University today. Applied Biosystem 3010xl and Agilent 2100 Bioanalyzer were donated to our laboratory by Professor Makoto Kuro-o (Center for Molecular Medicine). Thank you Prof. Kuro-o ! 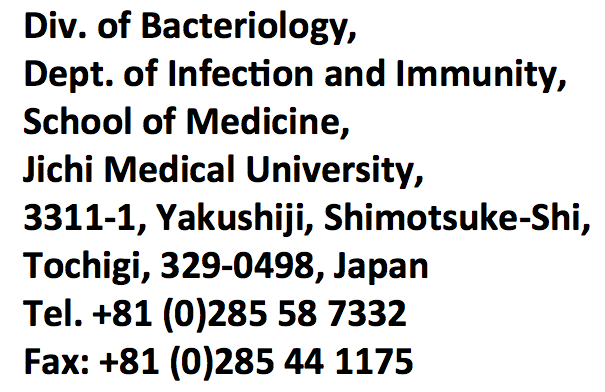 Grant application entitled “Development of anti-Helicobacter pylori drugs based on the combinatorial synthesis” by Associate Prof. Shimomura for The Promotion Funds of A-STEP from Japan Science and Technology Agency (JST) was approved. Graduate student Dr. Avarzed Amgalanbaatar is appointed as Research Assistant. Assistant Professor Mr. Yusuke Sato'o joined our Diivision as a new faculty member. Lecturer Mr. Shinya Watanabe joined our Diivision as a new faculty member. Professor Dr. Longzhu Cui is appointed as The Third Professor for the Division of Bacteriology. Retirement party for The Second Professor of Division of Bacteriology, Professor Dr. Yoshkazu Hirayi was held at Jichiidai, Tochigi. If you are prospective graduate student, please see the recruitment page.